Mayor Bill de Blasio stood in solidarity with 30,000 New York City residents on Tuesday who were enrolled in the Deferred Action for Childhood Arrivals program, as nearly four dozen arrests were made at protests over President Donald Trump’s decision to eliminate the policy. Protesters then tried to march over the Brooklyn Bridge, but were stopped short by police. Cops met the march near the entrance of bridge, and 13 people were arrested after some protesters sat down in the street when they were denied access. The arrests were in addition to the 34 people who police said were cuffed with plastic zip ties outside Trump Tower at a rally earlier Tuesday. Eric Phillips, a spokesman for de Blasio’s office, said those who cooperated with police would be ticketed and released without having their fingerprints taken. Shouts of “Undocumented! Unafraid!” and “No papers! No fear!” could be heard outside Trump Tower as some 200 people gathered near the Fifth Avenue building shortly after Attorney General Jeff Sessions announced the Trump administration was rescinding the program. 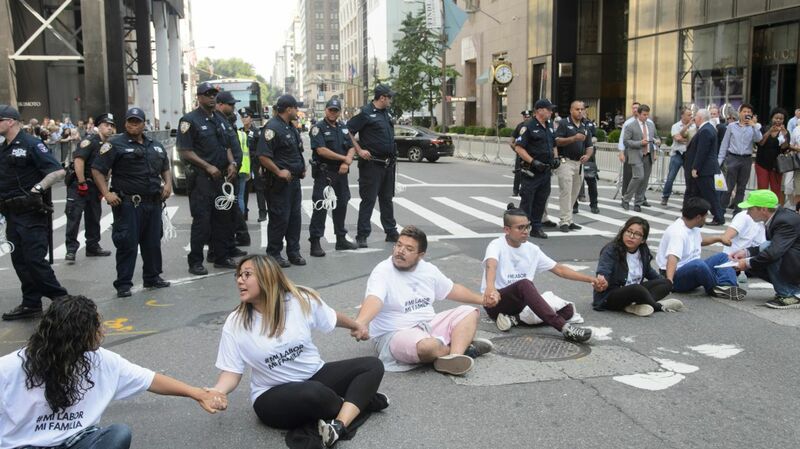 Demonstrators linked hands and formed a human chain that blocked traffic along 56th Street and Fifth Avenue in front of the president’s namesake tower. Among the demonstrators, some of whom gathered at 59th Street and Fifth Avenue shortly before 11 a.m. to march southward to 56th Street, was Luis Chicaiza. A DACA recipient from Hackensack, Chicaiza, 28, said he moved to the United States from Ecuador when he was 10 years old, and he now works at a Cheesecake Factory in New Jersey. “DACA wasn’t a gift. There were many brave students who fought hard for this,” said Cata Santiago with Movimiento Cosecha, one of the advocacy groups that organized the demonstration. Santiago, speaking to rallygoers, said the program has been “life changing” for the 800,000 immigrants who qualified for the program that allowed enrollees to remain in the country to work and study without the threat of immediate deportation. There are 42,000 DACA recipients in New York, according to Gov. Andrew Cuomo. Several of the protesters outside Trump Tower noted that DACA only provided temporary protection for immigrants, and they called on Congress to pass legislation that would offer a more long-term solution for the nation’s estimated 11 million immigrants living here illegally. Trump’s phaseout of DACA, an Obama-era program created by executive order in 2012, gives Congress six months to come up with an alternative. Back on the steps of City Hall Tuesday evening, Cardinal Timothy Dolan and the Rev. Al Sharpton joined de Blasio in a show of support for the so-called Dreamers. De Blasio said the city will “use every legal avenue” to defend New Yorkers affected by Trump’s decision. The mayor urged Dreamers who need legal advice to call 311 and promised those who are feeling unsure about what the future holds that the NYPD would not act a deportation force. “We are here for you,” the mayor said. Outside the New York Immigration Coalition’s midtown offices, immigration advocates and local politicians, including city Comptroller Scott Stringer and Public Advocate Letitia James, decried the decision and called on Congress to act quickly. Stringer said he’s never been more ashamed of Trump and his administration. “But make no mistake, we are here today to send a loud and clear message to Congress: You keep this up and you’re going to be on the unemployment line and we will put you where you belong which is out of public life,” the comptroller added. Flor Reyes, a 20-year-old senior at Lehman College, said being covered by DACA gave her a “sense of hope” and inspired her to apply to college. Reyes broke down in tears as she thought about telling her mother, who has five other children, that she may no longer be able to help her financially. Similar protests were held on Aug. 30, when news broke that Trump was considering a repeal of the program, and again on Aug. 15, when the president was in town for meetings. DACA applies to immigrants who came to the country illegally before their 16th birthday, who were younger than 31 before 2012, haven’t been convicted of a felony or major misdemeanors, and are in school, graduated from school or are honorably discharged veterans of the armed forces or Coast Guard.